Robert M Wah, MD was inaugurated as the 169th president of the American Medical Association in June 2014. Born and raised in Oregon, he is the first Chinese American to assume that position. Dr Wah will be the keynote speaker at the Chinese American Medical Society’s Gala in November 2014. CHICAGO – Robert M. Wah, M.D., a reproductive endocrinologist and ob-gyn in McLean, VA, has been sworn in as the 169th president of the American Medical Association (AMA), the nation’s largest physician organization. Wah, who is the organization’s first Chinese-American president, will focus his tenure on advancing the AMA’s three strategic areas: improving health outcomes, accelerating change in medical education, and enhancing physician satisfaction and practice sustainability. Dr. Wah served more than 23 years on active duty as a captain in the U.S. Navy Medical Corps. A nationally recognized expert in health information technology, he was the first deputy national coordinator in the Office of the National Coordinator for Health Information Technology (ONC), U.S. Department of Health and Human Services (HHS), working to advance the president’s executive order to have electronic medical records for most Americans by 2014. Dr. Wah now practices and teaches at the Walter Reed National Military Medical Center in Bethesda, Md., and the National Institutes of Health. He also serves as chief medical officer for Computer Sciences Corporation. 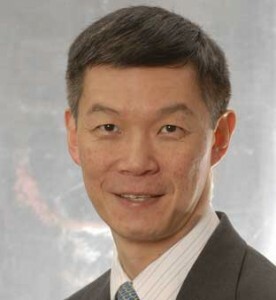 Dr. Wah served as chair of the AMA’s Board of Trustees from June 2011 to June 2012. During his 17 years as a member of the AMA House of Delegates, Wah has held several previous leadership positions in the AMA, including chair of the AMA Council on Long Range Planning and Development, chair of the Young Physicians Section and chair of the Section Council on Federal and Military Medicine. Dr. Wah has served on the American College of Obstetricians and Gynecologists’ Executive Board and its Health Care Commission. He also serves on the Board of Trustees of the Evelyn McKnight Brain Research Foundation. Dr. Wah is the recipient of numerous awards and was most recently named among the country’s 50 Most Influential Physician Executives by Modern Healthcare. Born and raised in Oregon, Dr. Wah is certified by the American Board of Obstetrics and Gynecology in both ob-gyn and reproductive endocrinology. He graduated Phi Beta Kappa from the University of Oregon with a bachelor’s in chemistry and received his medical degree from the Oregon Health Sciences University. He completed his ob-gyn residency at the National Naval Medical Center in Bethesda, and a reproductive endocrinology fellowship at Harvard in the Brigham and Women’s Hospital in Boston. Dr. Wah is also a graduate of the Advanced Management Program at Harvard Business School.